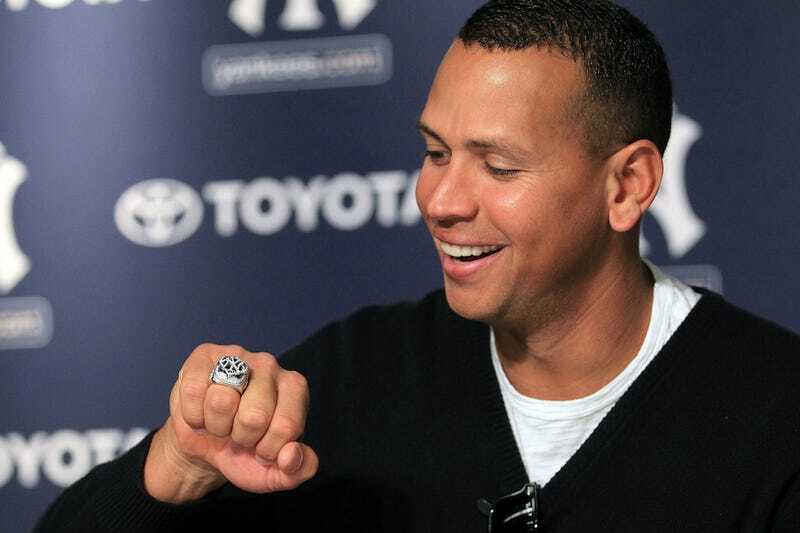 Alex Rodriguez's 2009 World Series ring will go up for auction tomorrow morning with an initial price tag of $5,000, though Rodriguez is not selling it. Rather, his steroid-mule cousin, Yuri Sucart, sold the ring to an auctioneer for $5,000 and some think the ring could fetch as much as $40,000. Rodriguez evidently gifted the ring to Sucart and, as is usually the case when people try to auction a unique piece of memorabilia at a fraction of its potential worth, Sucart is getting rid of it because he is "tired of the notoriety that comes with being associated with Rodriguez" and not "really, really hurting for cash." 1010 WINS' Gene Michaels did some man-on-the-street reporting with noted Yankees fan "Jim" who thought the whole thing was "awesome." Until he heard the price, which was not-so-awesome for him. But did anyone other than Jim have any thoughts and, if so, Derek Jeter—Derek Jeter to the Derek Jeter—as a Jeter? "Most people I met said they would not want that ring, but if a certain shortstop's ring became available, well then they'd be all in." That's the side no one talks about when they talk about being a True Yankee Fan of a True Yankee, the less-glamorous side. A True Yankee would never give away his World Series ring so you'd never get a chance to buy it from a down-on-his-luck relative. So even though it comes with a certificate, it's probably a fake.